2. When writing an email, every word matters, and useless prose doesn’t. Be crisp in your delivery. If you are describing a problem, define it clearly. Doing this well requires more time, not less. You have to write a draft then go through it and eliminate any words that aren’t necessary. Think about the late novelist Elmore Leonard’s response to a question about his success as a writer: “I leave out the parts that people skip.” Most emails are full of stuff that people can skip. 3. 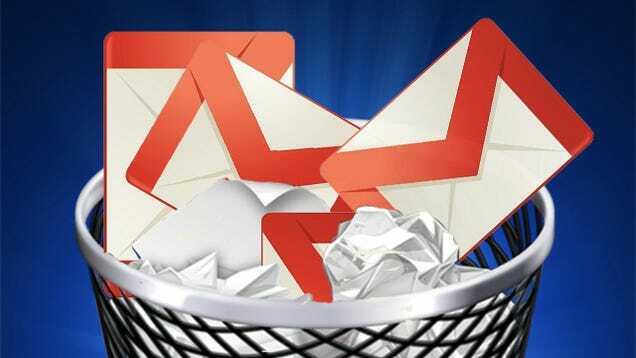 Clean out your inbox constantly. How much time do you spend looking at your inbox, just trying to decide which email to answer next? How much time do you spend opening and reading emails that you have already read? Any time you spend thinking about which items in your inbox you should attack next is a waste of time. Same with any time you spend rereading a message that you have already read (and failed to act upon). When you open a new message, you have a few options: Read enough of it to realize that you don’t need to read it, read it and act right away, read it and act later, or read it later (worth reading but not urgent and too long to read at the moment). Choose among these options right away, with a strong bias toward the first two. Remember the old OHIO acronym: Only Hold It Once. If you read the note and know what needs doing, do it right away. Otherwise you are dooming yourself to rereading it, which is 100 percent wasted time. If you do this well, then your inbox becomes a to‑do list of only the complex issues, things that require deeper thought (label these emails “take action,” or in Gmail mark them as starred), with a few “to read” items that you can take care of later. To make sure that the bloat doesn’t simply transfer from your inbox to your “take action” folder, you must clean out the action items every day. This is a good evening activity. Zero items is the goal, but anything less than five is reasonable. Otherwise you will waste time later trying to figure out which of the long list of things to look at. 4. Handle email in LIFO order (Last In First Out). Sometimes the older stuff gets taken care of by someone else. 6. When you use the bcc (blind copy) feature, ask yourself why. The answer is almost always that you are trying to hide something, which is counterproductive and potentially knavish in a transparent culture. When that is your answer, copy the person openly or don’t copy them at all. The only time we recommend using the bcc feature is when you are removing someone from an email thread. When you “reply all” to a lengthy series of emails, move the people who are no longer relevant to the thread to the bcc field, and state in the text of the note that you are doing this. They will be relieved to have one less irrelevant note cluttering up their inbox. 7. Don’t yell. If you need to yell, do it in person. It is FAR TOO EASY to do it electronically. 9. Help your future self search for stuff. If you get something you think you may want to recall later, forward it to yourself along with a few keywords that describe its content. Think to yourself, How will I search for this later? Then, when you search for it later, you’ll probably use those same search terms. This isn’t just handy for emails, but important documents too. Jonathan scans his family’s passports, licenses, and health insurance cards and emails them to himself along with descriptive keywords. Should any of those things go missing during a trip, the copies are easy to retrieve from any browsers. The optimistic vibe in MBA hiring has apparently met or exceeded expectations, according to a new study of job placement and salary data at the top 30 U.S. business schools by Poets&Quants. There was no shortage of job offers for graduating MBAs in the Class of 2013, making predictions for the upcoming year fairly upbeat. This year, well over half of Poets&Quants’ 30-top-ranked U.S. schools reported stable or improved job placement rates. Some schools reported dramatic increases in job offers to their graduating students. The University of North Carolina’s Kenan-Flagler School saw an improvement of eight percentage points over last year so that 96.1% of its MBA graduates had job offers three months after graduation, up from only 88% last year. Along with Ohio State’s Fisher College of Business, Kenan-Flager posted the best MBA job placement rates for a public business school in the U.S. The biggest surprises in the study? For the second consecutive year, Emory University’s Goizueta School of Business boasted the best MBA placement record of any U.S. business school in the Top 30, with 98.1% of the Class of 2013 reporting job offers three months after graduation. That is a full ten percentage points ahead of UCLA’s Anderson School, with 88.0% of graduates having offers, or the University of Michigan’s Ross School of Business, where 88.7% of this year’s MBAs had offers three months after commencement. Of the big name players in the MBA market, the best numbers came from two schools that have had to adjust to significant downsizing on Wall Street given their renown strength in finance. The University of Pennsylvania’s Wharton School reported that 97.8% of its Class of 2013 had a job offer three months after graduation, while Columbia University’s Business School reported that 97.0% had offers. After Goizueta, Wharton and Columbia had the best MBA placement records in the U.S. this year. New York University’s Stern School, whose fortunes are also somewhat tied to Wall Street, had its best MBA placement year in the past four years, with 96.0% of this year’s class with job offers three months after commencement. Another surprise. Both Wharton and Stanford Graduate School of Business graduates reported higher median starting salaries this year than graduates of Harvard Business School. 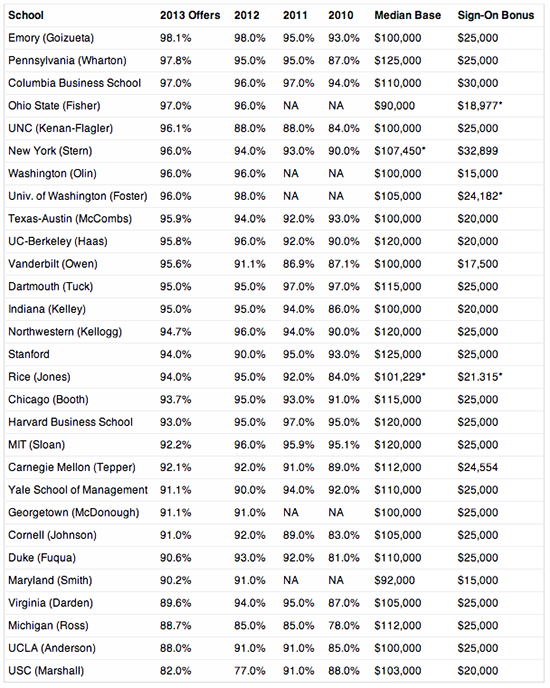 In all likelihood, it’s the first time that Wharton’s base salaries have exceeded Harvard. The difference is little–just $5,000–but it’s a completely unexpected turn of events. Wharton and Stanford MBAs earned the highest median salaries this year–$125,000–with Harvard next at $120,000, tied with Northwestern University’s Kellogg School of Management, MIT Sloan, and UC-Berkeley’s Haas School of Business. Harvard attributed the difference to the fact that HBS students are pursuing more options where they can have impact sooner rather than later. This year, for example, there was a 50% increase in the numbers of students going into the technology sector, which tends to pay less than either consulting or banking. Some 18% of the class took jobs in tech, up from 12% of the class in 2012. “For many of these folks, that meant taking an equity stake in a new or recent venture, rather than salary,” explained Kristen Fitzpatrick, who heads Harvard’s career and professional development office. Meantime, roughly 5% of the class took jobs in the non-profit sector, up from 3%. “They will definitely make their mark, but not win recognition for a high salary,” adds Fitzpatrick. “Beyond all this, the numbers of the class going into high-paying PE/VC firms are down–10% this year, down from 16% last year.” Add it all up and for the first time in history, Harvard grads made less than the MBAs at Wharton. More telling than the salary numbers, however, are the latest placement stats. By and large, they confirm a strong and continuing recovery in the market for top-ranked MBA graduates. Some 23 of 26 reporting schools in Poets&Quants Top 30 report that more than nine out of every ten graduates had at least one job offer three months after graduation. The numbers are so impressive they very nearly put to rest the rather dismal statistics that came out of these same schools during the height of the Great Recession in 2009 and 2010. Consider Vanderbilt University’s Owen School, which reported all-time high placement and pay numbers this year: 95.6% of the school’s graduating MBAs had job offers three months after graduation, up from 91.1% last year, 86.9% in 2011, and 87.1% in 2010. Median salaries for the Class of 2013 showed a sharp increase to $100,000 from $92,000 last year. “On-campus recruiting is up 15% since the 2010-2011 academic year and the number of companies making multiple offers has grown significantly,” says Reed McNamara, managing director of Owen’s Career Management Center. “Most notable is the rapid rise of Amazon to its position as the most active employer with 13 accepted internship and full-time offers last year.” Other firms with multiple accepted offers, according to McNamara, include Deloitte (8), ExxonMobil (8), DaVita (8), Mattel (8), Nissan North America (6), The North Highland Co. (6), Capgemini (5), and Goldman Sachs (5). The industries doing the heavy hiring this year was consulting and finance. But an increasing number of MBA graduates went into the technology sectors, often with smaller startup companies, as Harvard reported. And many more started their own companies right out of school, including a record 18% of the Class of 2013 at Stanford Graduate School of Business. Amidst the good news on the MBA hiring front, there were still more than a handful of schools reporting declines in job placement. They include Harvard and MIT Sloan, along with the business schools at Duke, Virginia, and UCLA. Though a school’s placement numbers can be off in any given year due to geography or industry focus, highly ranked schools that consistently lag behind the averages are more likely to underinvest in career services function or suffer from lackluster management of the function. But there can be any number of reasons why a school’s placement rates can trail peers or simply fall. At Virginia’s Darden School, job offers three months after graduation slipped to 89.6% from 94% last year and 95% in 2011. Jack Oakes, assistant dean for career development at Darden, says the drop is the result of several “patterns” that have emerged in recent years. “People are increasingly focused on niche hiring opportunities in very targeted locations,” he says. Tsung’s staff–composed of four full-time career coaches, two employer relations staffers, a director for the full-time MBA center, an office manager and a recruiting coordinator–also intervenes early before the 140 or so two-year MBA students step on campus. The group surveys incoming MBA candidates about their career goals and pairs them with rising second-year peer career coaches. Students undergo self-assessment to identify strengths and weaknesses and optimal career options. When they show up on campus in early August, students go right into a personal development course taught by career center staffers, alumni and recruiters. Before the month is out, often before other MBA candidates start class at their schools, Goizueta has its students already meeting with corporate recruiters. On Aug. 23 this year, for example, representatives from more than 25 companies, including Accenture, AT&T, Coca-Cola, Deloitte, GE Capital, Humana, Johnson & Johnson, J.P. Morgan, and Wells Fargo, came to an event called the Goizueta Career Connection to jumpstart the fall recruiting season. That is extraordinarily early for an MBA recruitment event. Many business schools have “blackout periods” for recruiters until October, hoping to keep employers at bay so that students can adjust to the academics. Goizueta’s policies recognize that the most anxiety provoking challenge for an MBA student is his or her career decision and ultimate job search. By stacking the odds in favor of a successful job outcome, however, the MBA students face fewer conflicts between the academics and the need to land a solid position at graduation. Student satisfaction has risen as a result. Even at 98.1%, still room for improvement? As high as Goizueta’s job placement rates are, Tsung seems not fully satisfied. “We had one more person come back with an offer ten days after the closing period (for reporting the three-month after graduation),” she says almost wistfully. That would have pushed the 98.1% close to 99%. Join one of the top business schools in Asia, Cheung Kong Graduate School of Business (CKGSB), for a scholarship and admissions information session in Taiwan. Discover first-hand the impact a top business school in China can have on your career from CKGSB's admissions manager. Learn about the support offered to Taiwanese students and how you can take advantage of the CKGSB's scholarships. Get MBA admissions advice from an admissions manager. Register today and start connecting with the world's most exciting economy! School presentation will be conducted in English. Learn about the strengths that will help you accelerate your career. On Dec. 16th, join Gavin Liu, Senior Manager of CKGSB's Career Management Center, to explore your career potential and discover how you can develop professionally. During a special MBA career workshop, Mr. Liu will provide assessments and career development counseling to help you set a course for success. Steve Jobs once said:" I'm convinced that the only thing that kept me going was that I loved what I did. You've got to find what you love." 14:00-15:30 "Beacon to a Brighter Future: Discovering Your Career Interests "
After graduating from CKGSB MBA, Gavin Liu has worked as admissions manager, career development manager, and senior manager of admissions and career development respectively. During the past 6 years, Gavin has provided consultations to thousands of MBA applicants and has helped hundreds of MBA graduates to find their career directions. Bentley University MBA Alumni Q&A: Why did you choose your MBA school? Where Innovation and Leadership meets! What are you waiting for, make haste! !